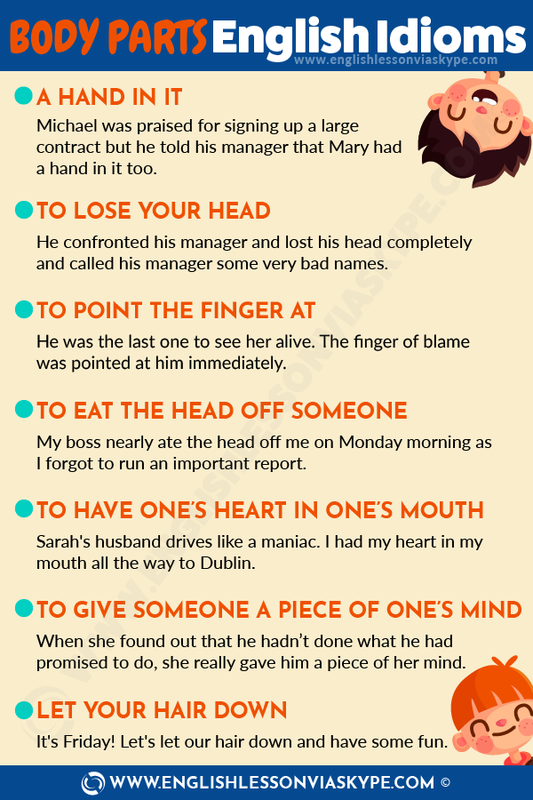 In the last blog we learned about English idioms related to body parts. There are many such sayings in the English language so I thought I might follow up and teach you some further English phrases and idioms associated with our body parts. To have a hand in something usually refers to you having a part to play in something. Michael was praised for signing up a very large new client account but he told his manager that Mary had a hand in it too and was also responsible for landing this client. Usually used when someone gets very angry over some issue and becomes very annoyed. John was told that he was losing his job even though he had performed very well recently. He confronted his manager and lost his head completely and called his manager some very bad names. When you decide to attempt something perhaps for the first time and decide to do it gradually or slowly until you are more comfortable about it. They asked him to invest some money in a new business. He thought it sounded a good idea but did not want to risk a lot so he decided to put his toe in the water and invest a small amount initially until he understood it better. Where there is perhaps an argument or an incident that has nothing to do with you, you still decide to get involved and offer your opinion. In such a situation you are said to “be sticking your nose in “to someone else’s business. If you know or believe you know who is responsible for or guilty of a crime you point the finger at that person. He was the last one to see her alive. The finger of blame was pointed at him immediately. When I applied for this position, they turned a deaf ear on me. No updates, no phone calls, nothing for days. to speak angrily or rudely to someone or to be very abrupt with someone. You can also use TO BITE ONE’S HEAD OFF with the same meaning. My boss nearly ate the head off me on Monday morning as I forgot to run an important report. Paul often puts his foot in his mouth by speaking before thinking. Last year Sarah broke her arm and her insurance refused to cover the costs so had to foot the bill herself. Sarah’s husband drives like a maniac. I had my heart in my mouth all the way to Dublin. When she found out that he hadn’t done what he had promised to do, she really gave him a piece of her mind. It’s Friday! Let’s let our hair down and have some fun. How to give good news in English? Here is your chance to master English Grammar Tenses so you can speak English fluently and with confidence, sign up for 3 hour English Grammar Rules Refresher Course. Click on the link to read more.